Over the last hundred years the climate and the weather have changed significantly. In everyday life we can feel it mostly in connection to the heat increase. The summers in continental climates are getting warmer and they start earlier and end later as the summer temperatures come in May and the last ones happen around the beginning of October. Moreover, country parts closer to desserts or the ones which have the ocean climate are having increases of temperature annually. This is the major reason why more and more households are equipped with AC devices. High-quality air conditioning system requires lots of fresh air. Therefore, air-conditioning equipment is so expensive, whether in terms of acquisition or due to its operating costs. Nevertheless, air conditioning is in many cases necessary. Imagine yourself waxing your car for hours when it is 90℉ outside, dreaming about cold beer and air conditioned living room, only realizing you don’t have one. 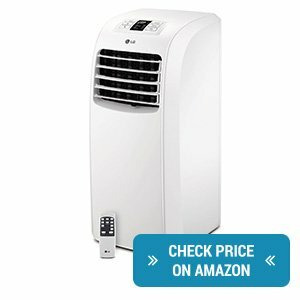 The easiest type of AC’s is the portable one, there are almost no issues during installing and the prices are always reasonable. 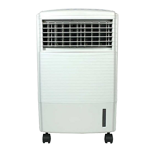 Portable air conditioning units are very compact and most of them can be literary placed everywhere. The first air conditioner on my list is the Whynter ARC-14S which can be used in three different ways. You can obviously use it as an air conditioner, but also as a fan and a dehumidifier, for when your environments is overflowing with humidity. 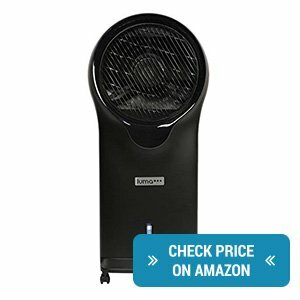 Thanks to its mobility it is a great choice for your home, office or any other place that needs cooling during the warm and hot summer weather. 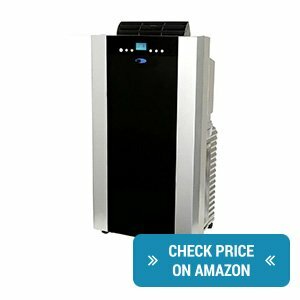 It most certainly ranks among the best air conditioners on the market right now. 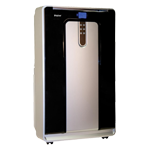 This portable air conditioner features a full thermostatic control, which ranges from 61°F to 89°F. Plus a possibility to set the timer for 24 hours and a remote control which enables you to control the product from a distance. As far as filters are concerned, this Whynter has carbon ones and a pre-filter that you can easily clean in your wash machine. 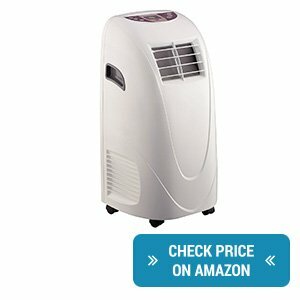 It is rightfully labeled as one of the best portable air conditioners. The noisiness is very low, in fact, this cooling product holds the title of the quietest portable air conditioner on my list. 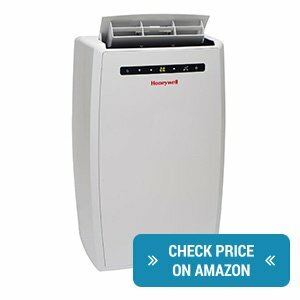 This Honeywell Portable Air Conditioner with Remote Control is part of the window air conditioner family which makes him a great asset to your office space or home. Thanks to its innovative and polished design it enables the cooling and dehumidifying of an area of up to 400 square feet. In addition, it uses the auto-evaporation system which contributes to the pleasant status of the environment, plus you don’t have to use any additional equipment. As you have probably guessed it already, this air conditioner can be accessed via a remote control and you can start the fan-only feature from whichever place you like. The LCD display lets you know which mode is currently on. The mobility of the product is guaranteed thanks to its caster wheels. 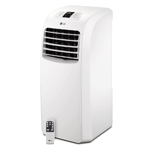 LG Electronics LP0814WNR 115-volt is the right choice for you if you are looking for a new technological alternative to your everyday portable air conditioner. 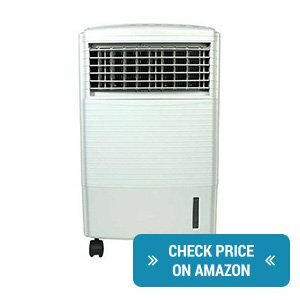 This product has been featured in many air conditioner reviews and there is a reason for that. 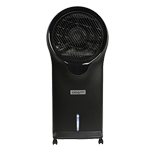 It can lower the temperature in a room or office with the surface area of 200 square feet and with its LED display you will always be aware which of the two fan speeds or two cooling speeds is currently running. The dehumidification feature is of course included as well and with the auto evaporation system you can easily use this portable air conditioner during hot summer days. Caster wheel are responsible for the movability of this LG air conditioner and the auto-restart saves all previous choices you have made until the unit is plugged in again. You don’t even have to take care of any water, plus with the 24-hour on/off timer you can cool down the room even if you are not in it. The Haier Portable Air Conditioner ranks among the best portable air conditioners on the market right now. 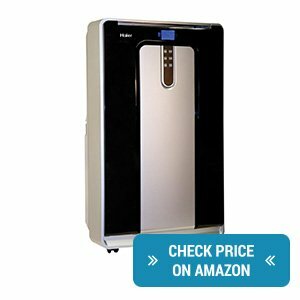 It is a portable AC unit which can improve the surroundings of about 600 square feet, cool them down and dehumidify your chosen places, rooms or offices. As far as the cooling is concerned, this Haier product has three cooling modes and three fan speed. The blue LCD display shows time and temperature and can be operated by the remote control. 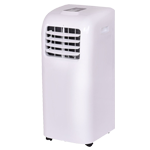 In addition, the filters of this portable air conditioner can be washed in the washing machine. The Global Air is a portable air conditioner that cools down a space of 300 square meters with its two-speed cooling system and 4-way air direction which helps divide the air throughout the whole room so no corner is left behind. Thanks to the digital LED display you can see the temperature and change it according to your needs. Even from a distance, with the remote control. The self-evaporative feature is included as well and the water gained from this process is re-used. 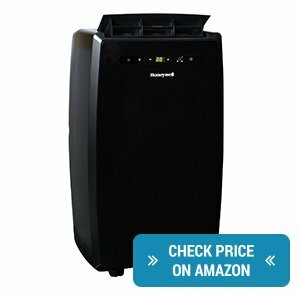 This one is certainly among the best portable air conditioners for the hot holiday season. 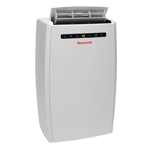 This Sunpentown indoor air cooling system is of the evaporate category with its evaporative system, humidifier and water air cooling system. It has a 10 liter water tank and three speeds from which you can choose, plus a timer. As with all of the air conditioners on my list, this one includes the remote control, too. This product serves best in an environment with the humidity below 40%. There is a need for ventilation while using this product, otherwise, humidity is collected in the room. A big advantage is a movability since this air cooler can move from place to place and can be controlled by a remote. It can either oscillate or evenly spread fresh air through your house. This air cooler was designed for spot cooling and can fulfill its purpose gracefully. This mobile air conditioner is capable of improving the temperature in the total space of 450 square meters and functions with the auto-evaporation system. This Honeywell product has all modern design features such as the digital LCD display which is easy to control also via the remote control. Its movability is guaranteed thanks to four caster wheels. Therefore, no installation is needed. 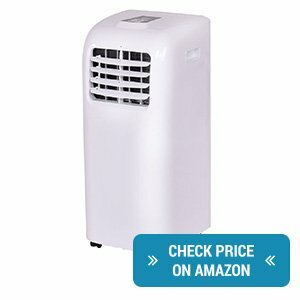 This can be easily labeled as one of the best portable air conditioners since it also includes a window venting kit which can be simply put down when not used. The Luma Comfort Portable Evaporative Cooler is one of the best evaporative air coolers on the market. The best conditions for its use are mostly hot dry weather with a low humidity of the soon-to-be cooler area of maximum 250 square meters. It has a three in one nature since it can function as a cooler, a fan and a humidifier. The rotation and three various speeds cover the before mentioned area whose temperature can be dropped by 20°F – 30°F if used in the ideal setting. Don’t worry about guessing the actual temperature setting, the digital display lets you know all the necessary data, plus this air cooler can be operated by a remote control. The usage of this unit is very comfortable. The main panel and the remote control have several buttons by which you can operate the whole unit. Front panel displays the current temperature and you can also choose the demanded temperature. Once this temperature is reached the machine will close down automatically. Moreover, it’s equipped with the timer. 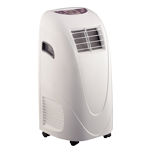 Except for cooling function, there are three other modes; dehumidifier, fan in two speeds, and a sleeping mode. Air filters are washable and can be reused so you don’t have to pay extra to money for replacements. You don’t have to worry about the right time for water tank emptying. Once the light on the front panel turns on just open the little vent on the back of the unit and the water will leak out. Even though the portable air conditioning units are less costly than the regular installed ones it is still an investment that should work for a longer period of time. That’s why it is important to be focused on several aspects before you will get one. I would recommend considering the brand and the manufacturer, power of the unit, additional functions, and noisiness. The first principle in case you are getting a portable AC unit for the first time is the purchase from a certified brand. A specialized company may advise you in advance, they have service lines and you can consult or review your possibilities and they will help you to choose the most appropriate product for your room or place. I do not recommend buying air conditioners in supermarkets or department stores because you do not have the guarantee that the service staff will give you expert advice and answer the questions connected to the air conditioning units. Another problem that may unpleasantly surprise you is the absence of a flexible service department or the unavailability of spare parts. Most specialized brands provide repairs and service as a part of their business. Air conditioning power performance is the most important technical point when selecting a particular air-conditioning unit. It is important to be sure that the unit you choose has the right performance in terms of the space which is supposed to be cooled. If the power is too high, the air conditioning will often switch on and off. On the other hand, if the power is too small, the air conditioner will be running continuously, resulting in higher energy consumption with low efficiency. 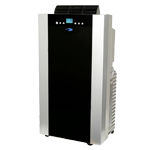 The best portable air conditioners can offer more benefits in addition to its basic function. A very useful one is the humidity removing function, as the air conditioning unit maintains humidity at levels of 40-60%, which has a positive effect on people with allergies. It eliminates dust and mold. On the other hand, if you have a problem with dry air go check out our 9 best humidifiers. Other features such as fan or sleeping mode are also beneficial. It is also good if the package includes the window kit which fits with the hose so you will have no extra issues to find the suiting one. If you have light sleep or constant noisiness disturbs you then you should choose your air conditioner according to the noise it makes. In general, the higher the power performance of air conditioning unit the louder the device is. However, some of higher quality devices are equipped with a component which makes sound them quietly but this is connected to the price which would be also higher. 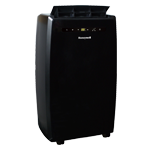 There is a solution in form of an air cooler, which is an economical alternative, plus there is no noise disturbance. However, air coolers are not AC’s and that’s why they do not work on the same basis as an AC. The positive difference is the fact that it can be moved really easy as there is no need for a hose, but the temperature does not go down that rapidly. Basically, coolers work as high-performance fans. I hope these recommendations will be helpful and that you will find the right portable air conditioning for you!